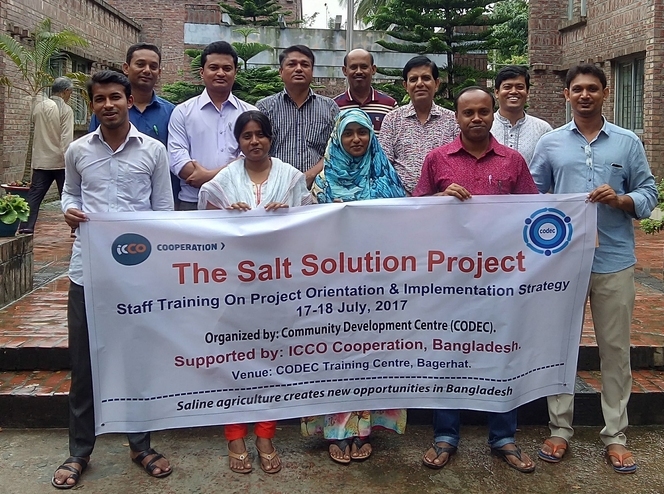 Together with Salt Farm Texel, ICCO will train 5,000 farmers in the coastal areas of Bangladesh to start growing salt tolerant crops. These are natural varieties of crops that do grow on saline soil. The contribution from the National Postcode Lottery enables these farmers to make their salt-affected land productive again by growing saline tolerant crops. This will improve their food security as well as their income. Worldwide less and less land is available for agriculture. One of the reasons is salinization, the increase of the salt concentration in the soil. This can have different causes, like flooding by the sea or by saline water rising through the soil. As a result, crops no longer grow on the land and it is no longer suitable for agriculture. Salinization Unfortunately salinization is a growing problem all around the world. Research of the United Nations University shows that 62 million hectares of agricultural land has already been affected by salt. That is over 18 times the size of The Netherlands. And this area continues to increase. Per day an average of another 2,000 hectare of agricultural land is lost by salinization. That is often in countries where there is already a food shortage, but worldwide too, salt poses a threat to the growing demand for food. In Bangladesh salinization is also a serious problem, especially in the coastal areas. The people who live in this area are poor to very poor. They largely depend on small scale agriculture to survive. But because of increasing salinization of the soil this is becoming harder and harder. And according to the World Bank this will become even worse over the coming decades. As a result people are no longer capable of feeding their families. They have no income and are forced to migrate to the cities, where they end up in slums or on the street. Solution for soil salinization As a solution for soil salinization, efforts so far have been mainly aimed at reducing salt concentrations in the soil. But the means used for that are expensive and damage the soil and the crops. Apart from that, their effects are short-lived. This innovative project turns this growing problem into a sustainable solution. Instead of fighting the salt in the soil, we want salt affected soil to be able to be used for agriculture again. That is possible by introducing varieties of well-known crops that do grow on salt affected land. This way, degraded soil becomes productive once again. And that offers new opportunities Funding and beneficiaries The Salt Solution project is funded by the National Postcode Lottery, Netherlands. ICCO Cooperation Bangladesh is lead partner and SFT is technical implementer and CODEC is implementing. Direct beneficiaries are 5000 small holder farmers and indirect beneficiaries are 25,000 small holder farmers. The project is working in 8 upazilas of 4 districts in saline affected coastal area of Bangladesh. 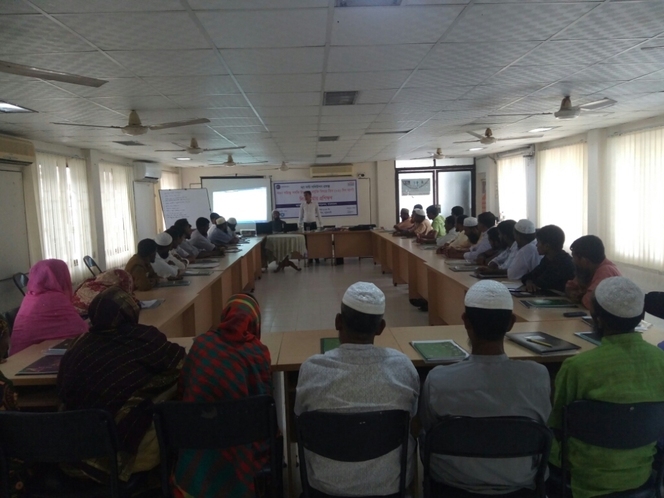 Lead farmer training has been started today at CODEC Training center, Patuakhali. Its a three daylong residential training. Total 37 lead farmers of Kalapara & Galachipa upazilla of Patuakhali district have participated in two separate batches. Field Officers of CODEC are the main facilitators of this training. 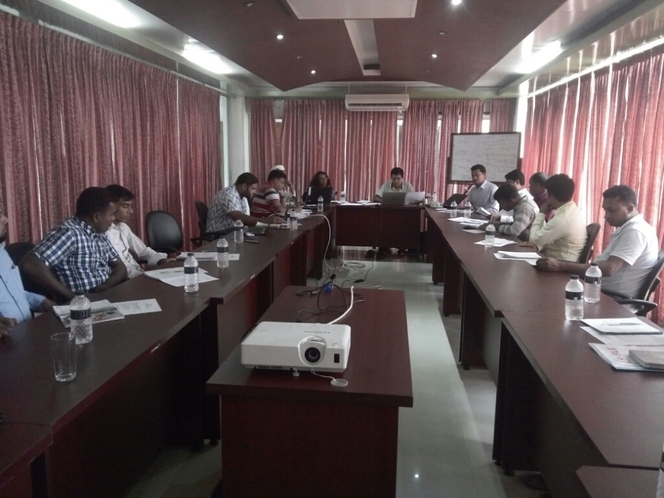 Bimonthly Coordination Meeting a regular DIP event has just taken place today at CODEC Training Center Patuakhali at 9:00am where all project staff of ICCO & CODEC are present . Meeting is anchoring by Mr. Mahbub, Area Coordinator, Barguna Region. Mr. Arun, PC, ICCO and Mr. Mamun, ADD, CODEC are giving their valuable time in this meeting. As planned and crucial activity of "The Salt Solution" project ICCO Cooperation organized 02 Days long "Lead Farmer's Training on Production Technology of selected crops" with active cooperation and implementation role from local partner CODEC, has been completed in all 04 upazillas under 04 Districts dated from 23rd to 26th October, 2017 among 05 separate batches (each batch had 16 lead farmers) of total 80 Lead Farmers. From the training lead farmers got a clear conception on production technology of salt tolerant crops, soil salinity testing and management techniques based on local context along with research and Demo plot outline and instruction. In all the batches, respective Upazilla Agriculture Officer attended to deliver their skillful lectures in the training session. Respective Field Officers and Area Coordinators of the Project facilitated the training sessions. And from ICCO Cooperation part, project Coordinator Arun Kumar Ganguly, M&E personnel and Technical Officer covered the whole training event to make it successful. 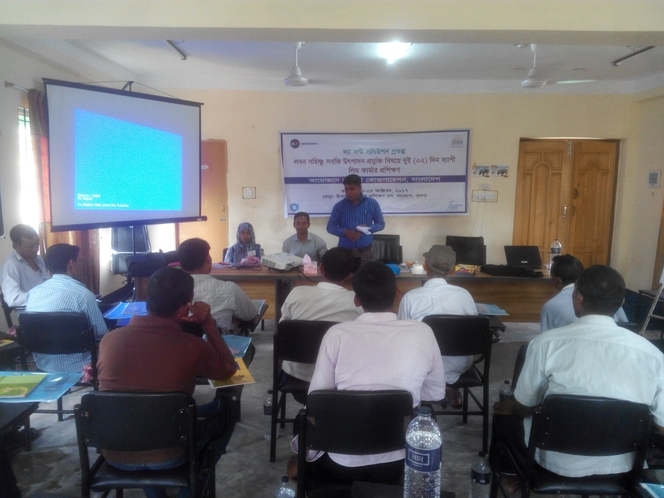 Two days long Lead Farmer training has been started today at RDF Tower, Barguna. This training is being facilitated by Md. Maniruzzaman (FO, CODEC). At the last day of Field travel SFT trainer visited Lead Farmer's Demo Plot space at Kalapara Upazilla under Patuakhali District. That was a hard effort to fight with rain at the field for soil and water salinity testing. And at the end Andrez finished his successful Field journey on training of Field staff to test soil and water salinity. Great effort!! 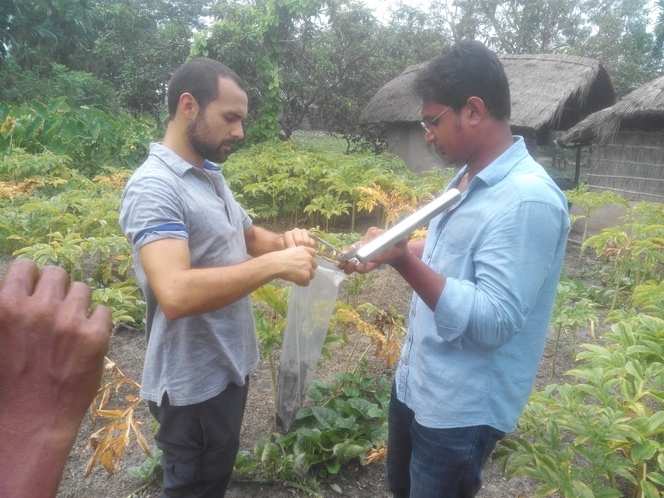 After passing couple of busy days at Khulna region, SFT personnel is at Barguna District on 27th Sep, 2017 to check salinity level of Lead farmer's Demo plot's soil and irrigation water as well as to strengthen assigned Field Officer's capacity to perform the same task on other Demo plot soil and water sample. On 26th Sep, 2017 SFT personnel visited Bagerhat Sadar Upazilla under Bagerhat District along with respective ICCO and CODEC staff to check salinity level of soil and water, used for irrigation. Under Dema union total 02 lead farmer's Demo plot space visited and tested soil and water sample to check salinity level. Assigned Field Officers were specially engaged with the process for their capacity building on salinity test. Just after completion of 02 Days long Residential Training on Production Technology of saline tolerant vegetables and Soil salinity Test, on 25th Sep, 2017 SFT personnel visited field along with respective ICCO and CODEC staff at Dacope Upazilla under Khulna District to check salinity level of soil and water, used for irrigation. Under 02 unions - Bajua and Pankhali, total 04 lead farmer's Demo plot space visited and tested soil and water sample to check salinity level. 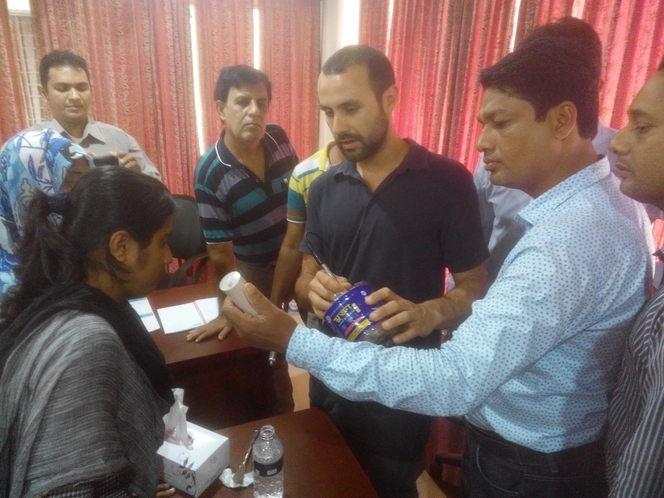 Assigned Field Officers were specially engaged with the process for their capacity building on salinity test. 2 Days long SFT Training is on Day 2!! Lots of experience sharing and technical sessions (ppt and practical) made the Training sessions interacting, interesting and fruitful that will really assist for successful Demo plot establishment. From 23rd September, 2017 a nice and highly technical training being started at CSS Ava Center in Khulna through ICCO Cooperation BD with active technical facilitation from Salt Farm Texel (SFT) trainer Mr. Andres Gonzalez. 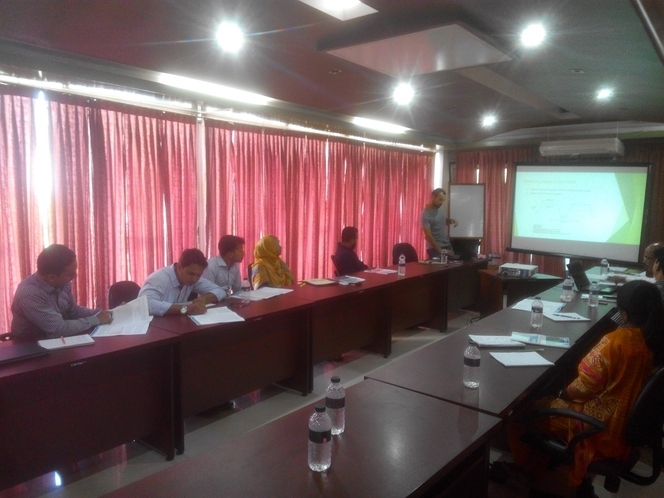 The Salt Solution Project of ICCO Cooperation, Bangladesh Supported by NPL has successfully organized a Training program titled â€œ5-Day Long TOT on Production Technology of Vegetables and Potatoâ€from 27-31 August 2017 for its Project team including CODEC staff at CSS AVA center in Khulna. In particular, the training objective was to enhance project staffâ€™s technical capacity on production technology of vegetable and potato in saline soils that in turn would benefit project farmers in saline areas. Hence, special importance was given while selecting training contentsin achievingits training objective. 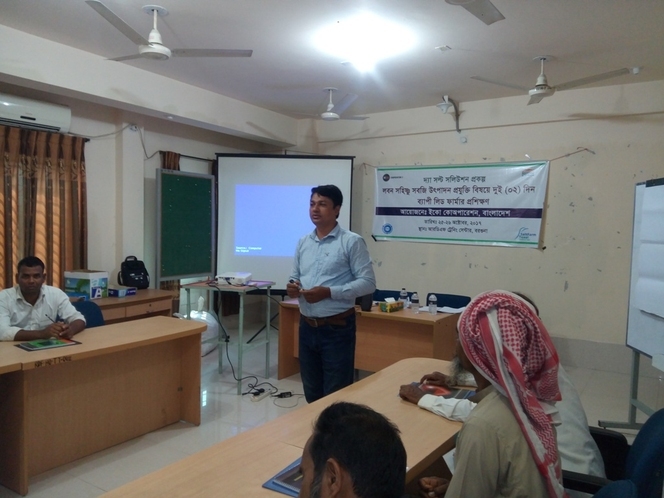 As result of this training, participants were able to learn science of specific crop production in saline soils including their recommended salt tolerant crops, varieties and their management practices. This training covers contents of production technology of Cabbage, Carrot, Kholrabi, Tomato, Bitter Gourd and Potato. Besides thetechnical sessions, it also covered some supporting sessions such as Soil Salinity Test, Facilitation Skill and Leadership Development etc. 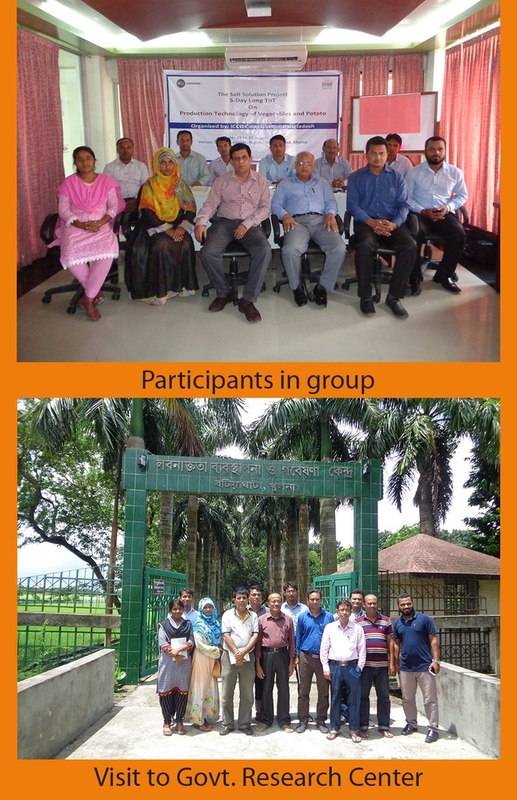 Further to this, participantswere taken for a half dayeffective field visits to Government â€œSalinity Management and Research Center (SMRC)â€at Boithaghata, Khulna to see the research activities on saline agriculture. 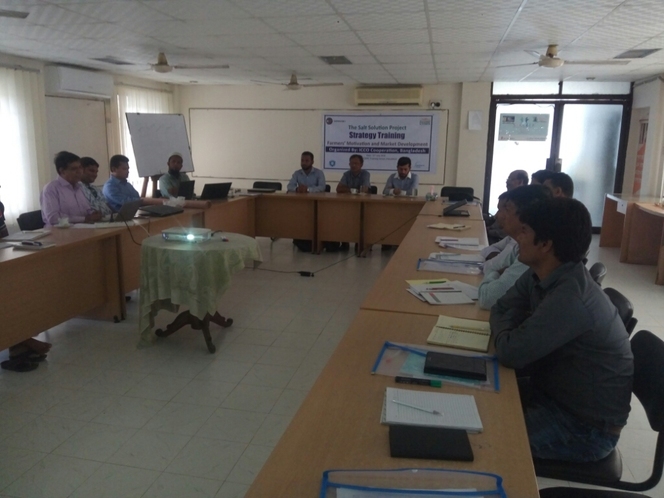 In addition, this training has efficiently engaged Government line departments such as Soil Resource and Development Institute (SRDI);Salinity Management and Research Center (SMRC) and Department of Agricultural Extension (DAE) as resource persons for some training sessions. They also expressed their willingness to provide governmentâ€™s full supports in research and extension activity for this project to make it a success. In fact, this training has made two successes through a. enhancing technical capability of the staff and b. establishing an effective support relation with government line departments as well. Finally it is offering cordial thanks & gratefulness to all involved who contributed lot to make this training a success. ToT for project Staff of The Salt Solution Project has been started at CSS AVA center today morning. The Training was inaugurated by Md. Abdul Latif, DD-DAE Khulna. Mr. Sachindra Nath Biswas, PSO and Divisional Head also present as special guest. Senior Scientific Officer of SRDI also conduct session today. 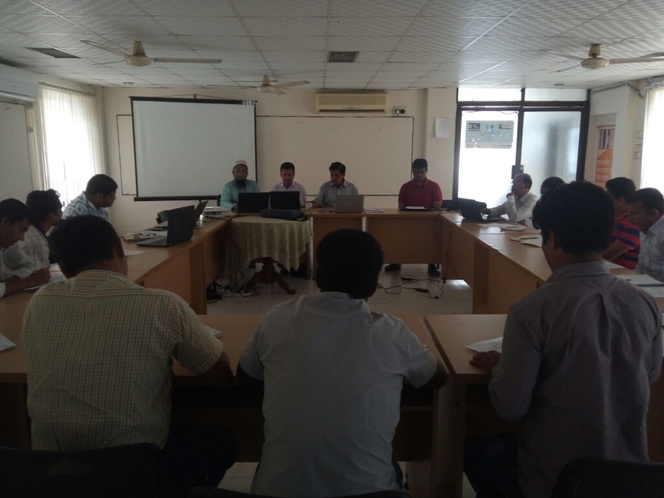 Yesterday 8th Augustâ€™17 the inception workshop of The Salt Solution Project has been taken place at RDF Tower in Barguna. 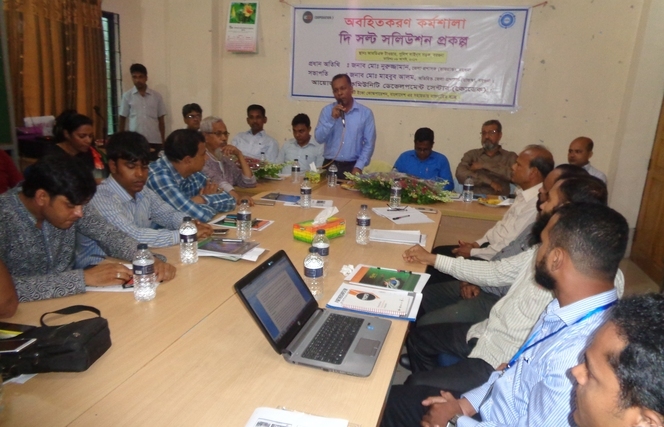 The workshop was inaugurated by Mr. Mahabub Alam, honorable ADC-Revenue, Barguna. Besides this, NDC-Barguna, DD-DAE, DAD-Agro service, DD-Marketing, DD-Women Affairs, Assistant Engineer-BADC, Principal of Agriculture Institute, Upazila Agriculture Officer, District Education Officer, Senior Upazila Fisheries Officer, President of Barguna Press Club, President of NGO Forum attended as especial guest. 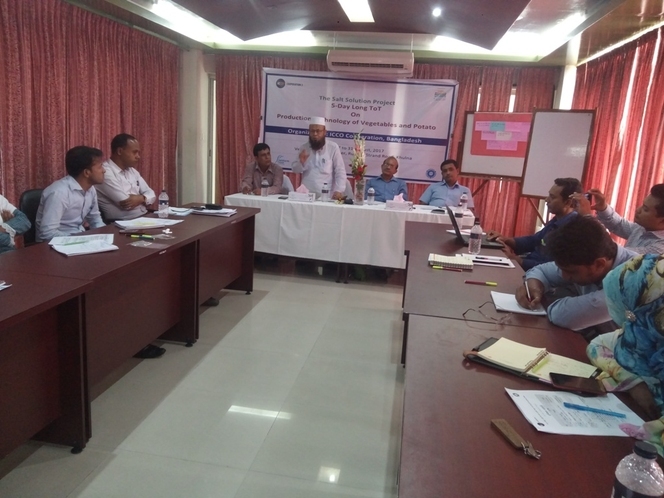 Two days long orientation on The Salt Solution project has held in CODEC training center in Bagerhat sadar, Bagerhat district from 17 & 18 July 2017. All staff of project has participated. The objective of the training was to develop common understanding on project, intervention and detailed implementation plan. During these two days, staff were participated actively, discussed about project goal, objective, result and activities, detail implementation strategy, beneficiaries selection criteria, beneficiaries profile, data collection tool like Akvo flow, really simple reporting system. The event were closed followed by developing individual work plan. Together with Salt Farm Texel, ICCO will train 5,000 farmers in the coastal areas of Bangladesh to start growing salt tolerant crops. These are natural varieties of crops that dó grow on saline soil. Poor vulnerable farming families in coastal areas. Direct beneficiaries 5000 small scale farmers. Indirect project will reach 30,000 small scale farmers. ICCO aims to achieve a lasting improvement for the farmers with this project. Therefore it is crucial to take into account right from the conception of the project, from the start and in every next step, the sustainability of the results after the project has formally finished. Over 50 years of experience in development co-operation has taught us that initiatives are only sustainable if they are locally embedded and supported by the local population itself. That means that the effect of gifts and subsidies is limited in practice. All too often it can be seen that as soon as the project is finished and the subsidy stops, the activities are not (able to be) continued either. Apart from this, subsidies can distort the market. For that reason the farmers in this project do not receive the seeds, fertilizers and other necessary inputs for saline agriculture for free. We do ensure that they are able to purchase them themselves. And for those purchases the farmers do not depend on the project. During the project the farmers already get access to special loans through existing institutions to be able to invest in the necessary inputs for saline agriculture. On average these loans can already be repaid after one season. In that way the farmers do depend not on the project and will be able to continue to cultivate saline vegetables also after the project has finished. To ensure that the activities continue also after the project is finished, they will be embedded in existing economic structures from the beginning. ICCO has extensive experience in building and strengthening sustainable value chains, in which small scale farmers are an equal party. In this project investments are made in the strengthening of local sales channels. These are both the sellers of the seeds, fertilizers and soil improvers necessary (input), and market parties that buy the harvest (output). By training these companies themselves, they are able to provide good services and technical support to the farmers. In this way a traditional trade channel will remain also after the project finishes, that works through the market mechanism of demand and supply. Furthermore, the project will invest in the farmersâ€™ capacities. By improving their technical skills, but also their marketing and business skills, they will be better able to successfully practice saline agriculture. Apart from this, in the project the foundation has been laid for better co-operation between the farmers, companies and service providers from the government. As a member of a farmersâ€™ group they are less vulnerable and have a stronger position in negotiations with this kind of parties. The relations that have been established with them will enable the farmers to continue the activities in the same way also after the project has finished. The successful results of these farmers will undoubtedly be followed by others. In doing so, they will be able to use the knowledge, the services and links built up that the chain for saline vegetables offers. And because the necessary inputs for the salt tolerant crops will be made available locally through the service providers, saline agriculture will no longer depend on this project after the first introduction. 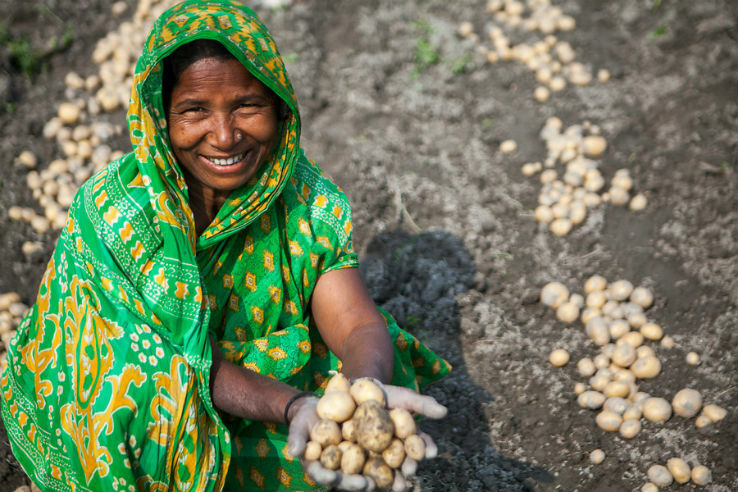 The aim of this project is therefore to increase the food production of vulnerable farming families in Bangladesh by introducing salt tolerant crops, to enhance their food security and income./ Improved food and nutrition security of saline affected small holding farmers in coastal belt of Bangladesh.